Oral Surgeon Dr. Gagnon can treat all of your Oral and Facial Surgery needs including wisdom teeth removal, tooth extraction, facial trauma, bone grafting, dental Implants and cosmetic surgery including Botox® cosmetic treatment and facial liposuction. Our doctors practice a full scope of oral and maxillofacial surgery with expertise ranging from facial surgery to corrective jaw surgery and wisdom tooth removal. He can also diagnose and treat facial pain and facial injuries, and performs a full range of dental implant procedures. Dr Gagnon has been featured as a Top Dentist in Wichita. Dr. Gagnon has been included as a Top Dentist in the Wichita Register’s Magazine’s Top Dentists issue in 2006, voted as a top dentist by local dentists and hygienists. Dr. Gagnon has also been featured as a Top Dentist in Wichita Magazine in 2008. Oral Surgeon Dr. Gagnon in Wichita is conveniently located near Andale KS. Dental implants have advantages over more traditional types of restorations. Dentures may be inconvenient, not to mention that dentures that slip can be uncomfortable. Once you learn about implant dentistry, you finally realize there is a way to improve your life. Implants help to preserve facial structure, preventing bone deterioration that may occur when teeth are missing. If your mouth is not ideal for implants, options such as bone grafting may be recommended for improved outcome. Our doctors utilize the most recent advances in dental implant technology. Call our office to schedule an appointment to see if you are a candidate for dental implants. Our doctors provide dental implants to Andale and surrounding areas. Why Should I Have My Wisdom Teeth Removed? Wisdom teeth are the last teeth to erupt within the mouth. When they align properly and gum tissue is healthy, wisdom teeth do not have to be removed. Unfortunately, this does not generally happen. Early wisdom teeth removal is recommended to avoid such future problems and to decrease the surgical risk involved with the procedure. Studies have shown that early evaluation and treatment of wisdom teeth result in a superior outcome for the patient. Patients are generally first evaluated in the mid-teenage years by their dentist, orthodontist or by an oral and maxillofacial surgeon. With an oral examination and x-rays of the mouth, our doctors can evaluate the position of the wisdom teeth and predict if there may be present or future problems. Our doctors provide wisdom teeth removal to Andale and surrounding areas. Orthognathic surgery is needed when jaws don’t meet correctly and/or teeth don’t seem to fit with jaws. Teeth are straightened with orthodontics and corrective jaw surgery repositions misaligned jaws. 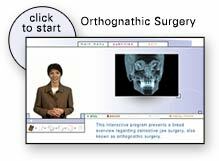 Who Needs Orthognathic Surgery? People who can benefit from orthognathic surgery include those with an improper bite or jaws that are positioned incorrectly. Jaw growth is a gradual process and in some instances, the upper and lower jaws may grow at different rates. The result can be a host of problems that can affect chewing function, speech, long-term oral health and appearance. Orthodontics alone can correct bite problems when only the teeth are involved. Orthognathic surgery may be required for the jaws when repositioning is necessary. Our doctors use modern computer techniques and three-dimensional models to show you exactly how your surgery will be approached. We can show you how your bite will be improved after surgery. We can also display a preview of your appearance after jaw surgery, using comprehensive facial X-rays and computer video imaging. Our doctors provide orthognathic jaw surgery to Andale and surrounding areas. If this is the first time you have visited our Wichita office, the mapping service below will assist you in finding our location. Simply fill out the form below, and you will be presented with directions that include a map, the travel time, and distance. If you need any additional information, please contact our office at 316-722-0800. Wichita, Maize, Goddard, Clearwater, Andale, Colwich KS.